One of my favorite cuisines is Chinese and I love to create dishes at home where I control the ingredients and oil content. Stir fry one of the things I create the most. It is such a yummy way to create healthy meals for my family. It can be created with an array of different meats and vegetables to make it different each time. 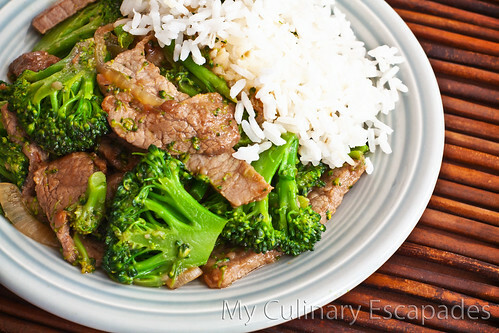 One of our family favorites is broccoli beef. This recipe includes very few ingredients and is so simple to make that it will amaze you at how tasty it is. For this recipe you will need to get all your ingredients out and ready to go. Stir frying moves quickly and you can’t be scrambling to find an ingredient in your pantry. Make sure stir fry beef is cut to bite sized pieces. Place into a container or plastic bag and add the soy sauce and ground ginger from the marinade ingredients. Mix to coat all pieces of meat and place in refrigerator for at least one hour. Just before cooking stir in the 2 tablespoons corn starch and coat the beef. In a large non stick skillet or wok heat one tablespoon of oil on high heat and place the stir fry meat into the pan. (If you are buying a wok I suggest you buy one with nonstick coating and thank me later.) Stir around using a wooden utensil until it is cooked. Remove meat from pan and set aside. Heat the other tablespoon of oil up in the pan and put the onions in. Stir fry until onions are getting carmelized and tender. Add broccoli and 1/2 cup water mixed with 1 teaspoon ground ginger. Place a lid on your pan quickly to trap the steam. Stir vegetables often to make sure they don’t burn and replace the lid. While broccoli is cooking whisk the ingredients for the sauce together. Cook vegetables until broccoli is just tender and add the beef back into the pan. Once meat is in the pan add the sauce mixture. Stir until sauce turns glossy and coats beef and broccoli. Remove from heat immediately and serve over rice.